We are edging closer to the end of the 2019 Dakar Rally and the competition is only getting more interesting with each passing stage. Even after the culmination of stage 8, which ran from San Juan de Marcona to Pisco, the final results can swing in favour of anyone, as evinced by the unpredictable results of each stage yet. Stage 8, which was the 'Super Ica' stage, saw the 10 fastest competitors from all categories (Cars, Moto, Trucks, Quads) start one behind the other. in a mixed start format. This meant a challenging start for the riders at the back as they had to battle intense amount of dust flying into their faces. However, despite inclement weather conditions, Indian teams Sherco-TVS and Hero Motorsports Team Rally had a rewarding run as Sherco's Michael Metge jumped five places from yesterday to finish the stage in 10th place while brother Adrien Metge made some terrific advances too by jumping from 27th to a 14th place finish. Hero's Oriol Mena and Joaquim Rodrigues (JRod) weren't too far behind as they finished the stage in 11th and 12th places, respectively. However, Mena, despite his stage 5 setback, has managed to make his way into the overall top 10. In the overall standings, JRod, Michael and Adrien stand at 18th, 24th and 26th positions, respectively. Lone wolf Aravind KP also had a good run in stage 8 as he took 39th place by the end, jumping seven places from his yesterday's finish. He retains the same positions in overall standings as well. 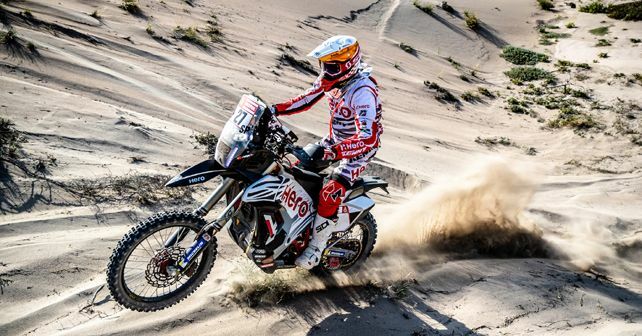 The leaderboard of the overall Moto class standings saw an unexpected retirement of yesterday's leader Ricky Brabec as he suffered an engine failure just 56km into the stage. Consequently, KTM riders took full advantage and reigning Moto class champ Matthias Walkner claimed stage victory. His teammate, Toby Price, had a heroic finish in third place as he endured immense pain from a broken wrist throughout the stage. Separating the two KTM riders was Husqvarna rider Pablo Quintannila who claimed the second spot. In the overall standings, Price and Walkner trade places while Quintannila retains P2, just 1 minute and 3 seconds behind Price. In the Car class, Peugeot privateer Sebastien Loeb drove with extreme determination to claim his fourth stage win of Dakar 2019, despite starting over two hours later than his rivals due to the mixed format start of the top 10. Loeb ended the 361km stage, the longest of the entire competition yet, 7 minutes and 27 seconds ahead of second-placed Nasser Al-Attiyah (Toyota). Jakub Przygonski of Orlen X-Raid claimed the third spot. Despite yesterday's puncture and today's second-place finish, Al-Attiyah continues to lead in the overall classification, 46 minutes and 29 seconds ahead of second-placed Nani Roma (Mini). Loeb holds strong in third place, only a few seconds behind Roma.